Toronto , Ontario's St. Patrick’s Day parade dates back to 1988 and is is one of the largest in North America. ..
Sunday, March 19, 2017 starting at 12 pm, and the line of march lasts one and a half hours at any given point along the route. The Toronto St. Patrick’s Day Parade begins on the corner of Bloor Street and St. George Street (near St. George subway station) and heads east on Bloor Street, turns south on Yonge Street and finally turns west on Queen Street, finishing at the parade reviewing stand at Nathan Phillips Square. 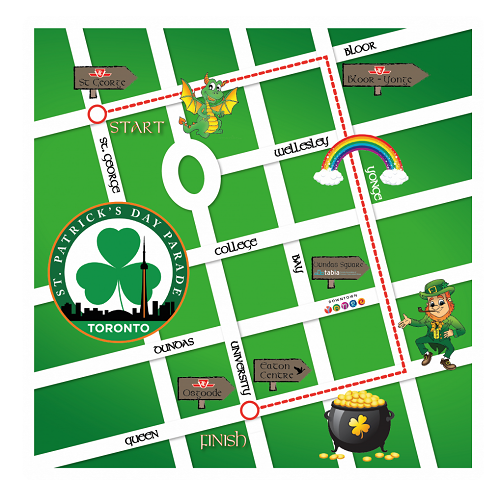 View a larger printable PDF version PDf the Toronto St. Patrick's Day Parade Route Map here. Access from the TTC subway can be made at the following stations: St. George, Bloor, Wellesley, College, Dundas and Queen.